It’s been a crazy couple of weeks for sure – but things may be settling back to the way they were, at least at surface level. Our visit to Portland was a short two day there-and-back adventure mainly to follow-up with Dr. Nick Eshraghi. We left Bend just before 8am and arrived at the hospital with a little time to spare before our scheduled 11:30 appointment. Pulling up to the Burn Center brought back some memories, but it was good to be back in a strange sort of way. I suppose knowing that we were just passing through made it easier than before. I parked the car in the space right across from the window where had been stationed with Max, we all got out of the car and proceeded into the Burn Center for our appointment – Max covered in sunscreen and wearing a cool looking wide brimmed hat with a long flap on the backside. He looked ready for safari. As we entered the building we pointed out to Ana where Max’s room was, she smiled. It was a chilling moment – of course the slight drizzle (which never stopped the whole time we were there) added to the effect, but I noticed that all of the windows had their curtains drawn. Not but two weeks earlier it was us in one of those rooms, curtains drawn as well. Into the Burn Center, through the tunnel and up to the fifth floor to our appointment we went. Once inside we filled out some paperwork and waited. We saw the little girl who had been admitted just days after Max was, she was there for a follow up as well. Her hand and arm were completely wrapped up, but she was smiling. She couldn’t have been any older than three. It was our turn. It was good to see the doctor again. He came in looked at Max and gave his diagnosis. I had been thinking of this moment for sometime, not knowing for sure if he was going to need more time to heal or need intervention of some sort – surgery. I had the best and worst case scenario worked out. Best case, the doctor would say everything was looking good and Max just needed some more time to heal and he would be fine. Worst case, Max would need surgery involving harvesting skin from one area of his body for another. I hadn’t really thought of anything in-between, which is what the doctor (surgeon) had prescribed. 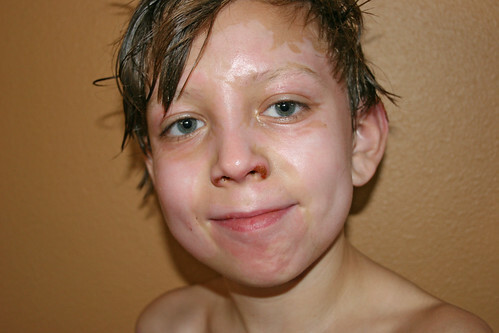 Max’s burns on his face, chest and lower arm were healing up just fine. There would be some slight discoloration at first, but over time he would look fine. There may be small areas that leave marks, but overall, with regular application of lotion and SPF, he should be good – with the exception of one area on his upper arm. This area looked the worst from the first day. 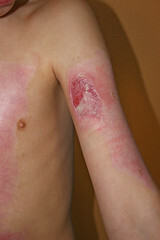 It looked deeper and rawer than all of his other burns and it just didn’t heal like the rest of them. To no fault of Max – his little body did excellent work repairing what it could – this burn was just too deep. Dr. Eshraghi gave us a couple of options: Wait a week and see how things progress. Within that time his body could still try to heal. If nothing changes and his wound still appears the same we could wait longer – OR – Remove the burn surgically, like you would remove a really large mole – cut out the area and pull his skin together. Time will tell, but we are preparing for the surgical option. Max’s other burn marks should blend away in about twelve months or so. Max has prepared himself for either outcome – it was evident in the doctors office, he wasn’t happy with the diagnosis, but understood the options. I (we) Laurie and I, we were just relieved that for the most part, Max was healing just fine. After seeing the doctor we had lunch in the hospital’s cafeteria, it was good – but there was an undertone of frustration building up in Max. What we thought was good news, just meant the likely possibility of more things being stuck in him – once again. We left for our next appointment at the Burn Center. It was good to see some familiar faces – faces of people who had taken care of Max not but a week ago. We gave them a sort of progress report on Max and they were glad to see him doing so well. One of the nurses told Max that he was one of their best patients and that his progress was due in part to his listening and cooperation. I’m so proud of him. We finally left the hospital and decided to visit the OMSI. What a cool place! We had never been before and it was the perfect time to go, it was raining, we had the kids, and some time to kill before check-in. We engaged in some of their exhibits but the best part was taking a tour of the USS Blueback submarine – that was super cool. Max and Ana really got a kick out of it. 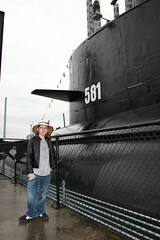 Max especially, he’s fascinated with anything related to military machinery, aircraft carriers, planes, tanks, and being inside an actual submarine – he was in heaven, although he was somewhat bummed that this particular sub didn’t see any heavy combat, or launch any torpedos at the bad guys, but regardless, he was in awe. We got to our hotel (The Inn at the Northrop Station) a cool swanky place with super fast access to the hospital, some restaurants, and a very cool street car (which we rode the next day). We checked in unpacked our stuff and realized we were starving. We walked through the pouring rain three blocks west and four blocks north to a Pastini. The funny thing was, the rain didn’t even phase us – we were all having a good time being together, knowing everything was going to be allright and a bowl full of pasta was around the corner (um – and a cold microbrew for mom and dad). Dinner was great. There’s nothing like having the family together especially for dinner. It would have been even better if there were more of us, but just the four of was great. It’s funny the first Pastini we’ve ever been to was in Bend (they just opened a couple of month’s ago) but over the past couple of weeks, we’ve eaten mostly at their original Portland locations. There was one on NE Broadway close to the hospital (where my sister got us take-out) and the one on NW 23rd close to the hotel. So now in addition to pizza, Max has added Pastini to his favorites. Sure it’s not a food group, but it’s close enough. I suppose it’s a bit of comfort to him/us knowing there’s a little bit of home away from home. Max even requested we stay at the same hotel this Friday because Pastini’s was so close. How can we say no? We walked back home stopping at a few shops on the way. The rain was still coming down but it didn’t matter. We got to the hotel got ready for bed and whatever the next day had in store for us. We decided at the breakfast table to skip Ana’s soccer game and leave a little later in the morning so we could ride the Portland Streetcar which stopped right in front of the hotel. It was a fun ride – a bit long (1.5 hours) but fun. We rode the whole loop, from NW Portland to SW Portland and back. We saw all sorts of people, it was cool. It kind of made me miss the city and all its offerings, diversity. If we were to ever move back to a city though, I’m not sure Portland would be it but who knows what the future holds, NYC would be a contender for sure. After the ride we packed it up and headed back south to Bendo. 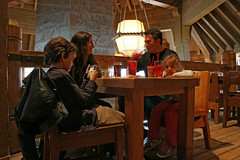 Laurie mentioned stopping off at Timberline Lodge – the thought was immediately appealing as none of us had ever been. The six mile diversion was set and we were on our way. Wow. Timberline Lodge was incredible. We totally lucked out too – as we walked in (through the pouring rain) we entered the main lobby area downstairs and were greated by a Forest Ranger, she told us she really wasn’t supposed to be there this late in the season, but happened to be there and was getting ready to give a tour, we jumped at the opportunity. We walked around gazing at the craftsmanship, artistry and just the overall magnificence of the lodge. So cool. So cool that people could get together in such a time to make something so wonderful. We stayed for lunch. The food was pretty good too, especially the meatloaf sandwich, yum. A good diversion for sure. We wound our way back home, passing the rain and clouds and into clearer skies. As we approached home the past two days had caught up with us and exhaustion was setting in. The kids were just as exhausted as we were as our road trip came to a close. Our fun family time was over and reality hit as we entered Bend – Max was bummed. Bummed that we were back and bummed that his ordeal was far from over. He lashed out at everyone in the car and pushed us to our limits. We had to go back into parental mode. It had been three weeks since Max had even seen any remote side of discipline, but his frustration turned to anger and we had to stop it – off to his room he went, along with his sister – both relegated to clean-up duty and solitary confinement for a short period. We all needed a break. A couple of hours past and we were greeted by my sister. Two gifts were delivered from our well wishing friends: A home made loaf of bread w/ a special topping from our friend Maeve, and a beautiful gift basket from Gale. Thank you both. The night melted away. An easy Saturday night. Sunday arrived and it was a mellow day. The highlight was dinner at mom and dad’s. Mom made my favorite – Beef Stroganoff with egg noodles, tasty. Max and Ana liked it too. It was a great dinner – all seven of us once again together, no worries. We shared our stories about our time in Portland and Max’s next steps in regards to his burns. We wathced part of Iron Man, and left early so the kids would get a good nights rest for school – which Max was kind-of excited for. Today was Max’s first day back at school since the incident. We accompanied him into his class and were greeted by his classmates. There was a big banner in the corner ‘Welcome back Max’, below was a table full of breakfast treats assembled by parents, kids and his teacher Miss Sterling, and assistant. It was great. we could tell Max was feeling good – he was a bit nervous on the way over, but once he walked through that door it was all good. He sat down in front of his classmates and fielded everyones questions. ‘Was it scary?’, ‘Did it hurt?’, ‘What was the best part? The Worst?’ – He answered the questions perfectly all on his own. He was ready and he wasn’t nervous at all. Both Laurie and I stood behind him and smiled – and answered a couple of questions as well. His classmates were great. They were curious, concerned, but most of all understanding. Laurie and I are so glad to be in such a wonderful community here in Bend and beyond – from Max’s school, classmates, and teachers, to our emergency services network in Bend and in Portland. To our family and friends who have supported us throughout the past several weeks. We are truly thankful for all of you. For once I am starting to feel like we’ve made it over a huge hurdle and that things are slowly but surely starting to fall in place as they once were. But things have changed. Seeing our son go through something like this was tough and not a day goes by that I don’t think of that day, but what happened has drawn us together, especially as father and son, so I’m thankful that he’s doing good. And look forward to many many more days of building legos and just hanging out.